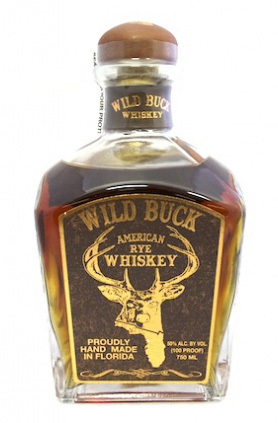 Info: Wild Buck is an American rye whiskey that comes from the NJoy Spirits Distillery in Florida. It’s made in a copper pot still in small batches from 100% all natural home grown rye grain and aged in custom made new charred American Oak barrels. Colour: Rich autumn gold, hints of rust. Nose: Really thick oily legs with a sweet rye nose. There’s vanilla, oak, rye grain, some liquorice, a mineral thing and some cracked pepper notes right at the back. Palate: Sweeter and smoother than I thought it would be at 50%abv, it’s very easy on your palate with a small pinch of spice to keep it interesting but mostly sticking with the sweeter creamy rye oils. The mineral nature remains in the background along with gentle vanilla oak notes from the small virgin casks and a handful of mushed up gooseberries. Finish: The finish is thick, oily, sweet and really fairly long, tempting you back for more! Thoughts: I’m sometimes not the biggest fan of american whiskey, but that’s like saying I’m not a big fan of wine; that’s over simplistic. What I do know is that I love this, it’s fantastic quality and really fun to drink. The smooth oiliness makes it a dram to easily fall in love with. It’s fine to drink as is, doesn’t need water or ice, although they’d be fine too. Many thanks indeed to my Twitter friend raithrover who found this in the US and dropped me a wee dram to try out. This entry was posted in Review, Whiskey. Bookmark the permalink.